I have a new tool in the workshop and it is a revelation! If you have been following my instagram feed, you will know about it already. It is my mirror. 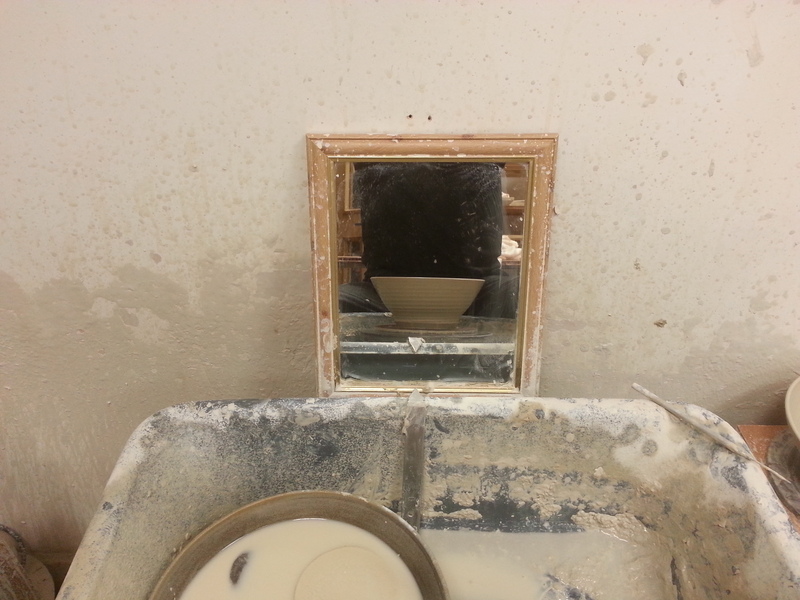 It is not uncommon for potters to use a mirror to aid their throwing but it has been such a revelation for me that I wanted to encourage those of you that don’t to consider using one. It is one of those times when having finally begun to use something, you think, ‘why didn’t I do that before!’ I cannot emphasise enough the impact it has had on my throwing. So… I have set the mirror up on the wall in front of me as I sit at the wheel, which means that I can see the wheel-head in it. When throwing without the use of a mirror, looking down from above, it is almost impossible to see what you are actually doing. 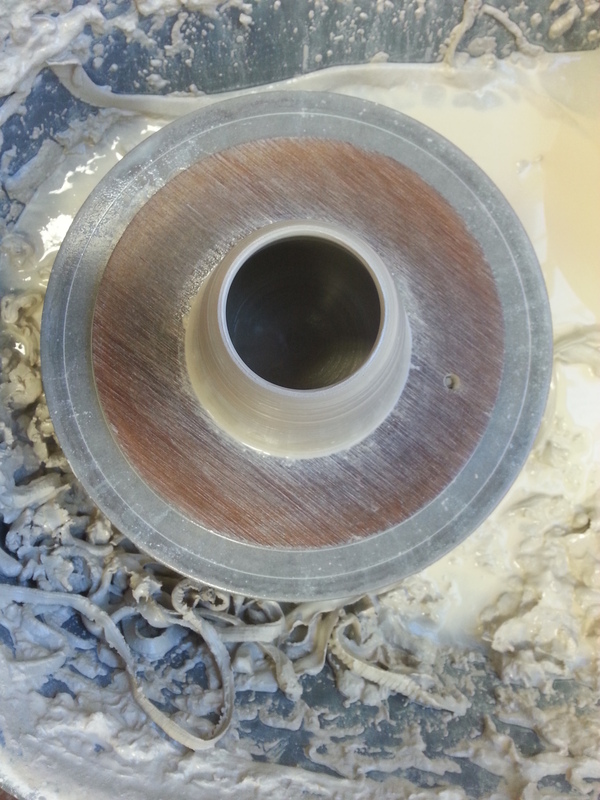 Having made a pull, you can lean back or twist to the side in an attempt to appraise the profile of the pot you are throwing but this is awkward and doesn’t allow for a good impression of the form that is being thrown. It is not really until the pot is taken off the wheel-head and held up that you can see if it is successful or not. There is no way of gauging the form as the pull progresses. 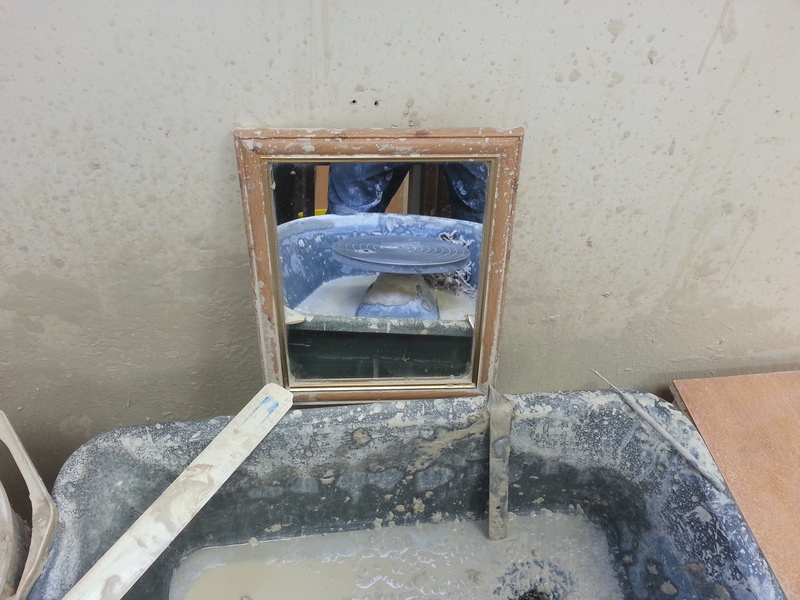 With the mirror, on the other hand, you can see the profile of the pot as it is being pulled. You can actually watch the form develop. You can see the angle of your first pull and adjust it if you need to. As the pot rises from the wheel-head you can adjust your hands according to the form. It is like watching someone else throwing the pot. It is like watching a youtube clip. Now, as I throw a pot, I mainly watch the one in the mirror – and every time it is thrilling. A lot of reading, and listening (Maggi Hambling), at the moment seems to be relating to the ‘life’ of a pot (or an object/artwork, generally); how to imbue that object with humanity; how to let it speak of something wider than just itself. I love the writing of Marguerite Wildenhain. She wrote a beautiful book, Pottery, Form and Expression, that I return to, and she has an essay, called ‘A Potter’s Philosophy’, in the book I am currently reading, A Potter’s Companion, edited by Ronald Larsen. Maggi Hambling, in her interview, Wildenhain, Bernard Leach (also in A Potter’s Companion) talk about skill not being the be-all and end-all. Wildenhain writes that technique ‘…is not enough to produce a really good pot’. Leach writes that ‘Because of the smoothness of perfection we yearn for imperfection. Imperfection – irregularity – is a necessity’. According to Leach, there is an important Korean word for this, thusness. Thusness is a place of intuition, feeling, acceptance; the Buddhist sense of being in the moment; of letting each pot flow according to the conditions at the time. That condition may be one of being hurried because we need to get home to the children, or some such thing. Acceptance – not of sloppiness but ‘an unconcern for natural flaws and irregularities’. This allows for great freedom, if the work is done in the right spirit and ‘with love’. There is humanity here. Wildenhain discusses it, too, in her essay. 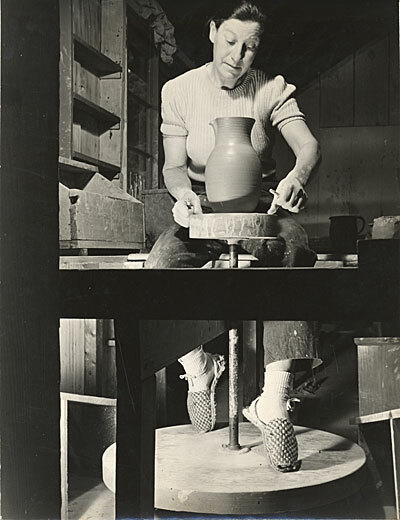 She writes that the best potters ‘were not only competent potters, they were also dedicated and inspired and there was no dichotomy between their life and their work. They made pots for daily need, but also, for beauty and in their dedication to their religious beliefs, to nature, to the gods, to Woman and Man. It was all one, and it was LIFE [Wildenhains’ capitals and italics]’. This, for me, stirs my heart. This is why one should make pots, not simply to demonstrate one’s skill. Warren Mackenzie, in an essay preceding Wildenhain’s, discusses a Hagi bowl that he was given. He writes that any competent potter could have made it and thousands of them were made by unknown potters all over Japan. He set it aside and it was many years before he got round to using it. But the more he used the bowl the more he began to relate to it as a utilitarian piece and to understand its qualities. Over the years, he has come to regard it as one the best pieces of pottery he owns. The more I read, and the more experience I get of making pots, the more I am getting a strong sense of the life of a potter, the life of the pots a potter makes; what it means to be a potter. While reading one of Wildenhain’s paragraphs about working being ‘All those painful experiments’, I thought “How brutal!” – ‘Trials and errors soon make you find out who you are, what abilities may be yours, which ones you do not have, how or whether you can respond to the world around you, or to your dreams. Sometimes, and more often than not, this is a painful voyage of discovery, but only through efforts and pain does one grow anyway. Is it not just that which develops the individual? To face oneself is the beginning of all wisdom and to evade the issue is cowardly.’ But this is true of making pots; this is true of life. I’ve been listening to Private Passions recently and there have been some great interviews, nothing better, though, than the one I listened to today with Maggi Hambling (click on the link and scroll down to the Hambling interview). It was the most wonderful surprise to find this interview. Hambling is fascinating, as she talks about art and life, and how, in her life, they are one. It is a deeply thoughtful and inspiring interview. One of the essays, Making Music Versus Merely Playing The Piano’ by Everette Busbee, challenges the notion of craftsmanship. Shoji Hamada said, “Skill is cheap”. Rosanjin called souless craftsmanship “a reckless tool”. Baudelaire wrote in a review of the 1900 Paris Salon, “The painting is getting better and better, and I find it a lamentable thing”. There is a fantastic story of a man who when asked what he is doing under a street light says that he is looking for something he lost over there. When asked why he isn’t looking over there said that the light is far better over here. You will always find something sooner or later in the light but it undoubedly won’t be what you were looking for. It has been interesting reflecting on this after reading Peter Dormer’s The Art of the Maker where he talks about skill, craftsmanship, being something you only get to when you no longer think about it, when you can’t remember what the rules are anymore. David Pye, in The Nature and Art of Workmanship, talks about handmade being the workmanship of risk, as opposed to that of certainty (objects made by machine). Making things by hand we are constantly on the edge of disaster, failure, and this tension is as it should be, this is the home of life and vitality. Busbee says that technique is a necessity, and that ceramics is one of the most technical subjects there is, which is right. It is the bringing together of the heart and the hand that is the key, feeling and skill, to make a pot that appeals to all the senses and speaks of a wider humanity. You are currently viewing the archives for March, 2014 at The Hopeful Potter.